The EmWat 1000 produces safe drinking water from any fresh water source at a rate of 1,000 litres per hour. The unit is ideally suited for use in field hospitals, remote or temporary base camps or staff camps and in any situation where there is a need for a flexible, reliable system. It is quick and simple to install and extremely easy to operate. 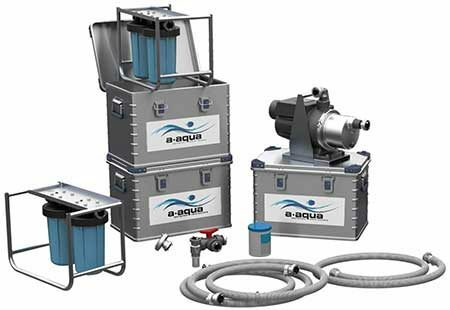 The basic unit consists of a series of filters that produce safe drinking water in four separate stages. It is supplied with all necessary hoses as well as an electric pump. Filter sets should be replaced every 60,000 litres. A Flocculation Module is available where additional pre-treatment is beneficial to the lifespan of the filters (turbidity above 80NTU) enabling chemical batch pre-treatment of the water in an onion tank. If the above options are required please add a note to the item in your basket and we will be pleased to provide pricing for all of your requirements. The EmWat 1000 is compact and light weight and can be easily deployed to emergencies in any location. The basic unit (pictured) is delivered in three rugged aluminium cases. Each case meets the requirements for most airlines to allow it to be carried on commercial flights as checked-in luggage.